While South Africa is still battling with connectivity issues and the rollout of free bandwidth to educational institutions, in other parts of the world AI is already making its effects known to educators and learners. Earlier this year, the South African Democratic Teachers’ Union addressed the shocking statistics revealing that 2800 classes across schools in KwaZulu Natal were without teachers, resulting in severely overcrowded classes and a shortage of representatives for critical subjects including Maths, Science and Accounting. Similarly, in another report, Education Member of Executive Council, Mandla Makupula, stated that up to 2000 schools in the Eastern Cape had only two to three teachers, whilst 219 schools only had one. This resulted in a dismal 59.3% matric pass rate. The South African Institute of Race Relations added to the conversation by stating that 84 high-schools across the country did not even offer Mathematics as a subject due to the shortage of qualified teachers. Although the Department of Education is currently looking at addressing this issue, it is going to be a long and arduous task. We need to start investigating possible alternatives we can invest in to help alleviate the pressure in the future, ensuring access to quality education for all, whilst delivering a teaching experience that meets each child’s individual needs. The reality of education in South Africa is that we cannot keep up with the demand for skilled and qualified teachers to educate our children, let alone prepare them for the future in the workplace. With the dawning of Industry 4.0 and the rapid transformation of the workplace through technology, it is estimated that 45-47% of jobs will be lost to automation. 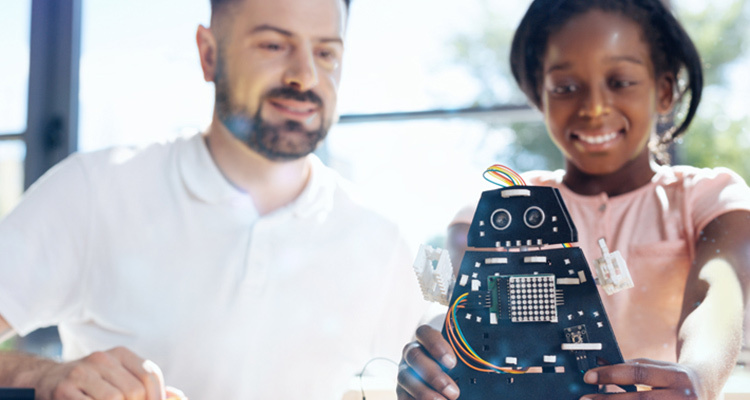 We have previously discussed how learning needs to adapt to meet these future needs by delivering content through different immersive technologies, but how can we solve the critical shortages of teachers and support the existing ones through Artificial Intelligence? Machine Learning (ML), a branch of AI that finds data in patterns is currently beginning to make its fierce debut in the Educational world. Third Space Learning, an online Maths tutoring platform in the UK, has integrated ML algorithms into their learning platform to provide real-time feedback to online tutors. It highlights where students are battling with concepts by following patterns of misunderstanding. The system not only sends alerts to the teachers but can instruct the online AI tutor to provide personalised and supplemental guidance to the learner. Thinkster, a company based in the US also utilises ML to track how learners arrive at their answers, potentially helping the learner to “re-programme” their thought processes for increased effective problem-solving. The AI tutoring system presents core theory and with the evaluation of the learner response, this feedback enables the system to formulate an optimal learner path to ensure subject mastery. Teachers and tutors can then focus on empowering themselves to be better educators and start recognising the patterns in learning behaviour. They can adapt their content delivery approaches where and when necessary. Recently, at the Georgia Institute of Technology, Ashok Goel, a computer science professor stealthily pranked his students by employing an AI “teaching assistant” who could help by answering the massive backlog of routine emails and forum questions sent by the students. “Jill Watson”, powered by IBM’s Watson, was trained by Georgia Tech’s researchers, who exposed Jill to over 40 000 student discussions on the forum, and taught her how to answer by using previous responses to related questions. This allowed the professors to focus their time on answering more technically complex questions, and the students were none the wiser. The above interventions are great solutions for when teachers are faced with overcrowded classes and do not physically have enough time to attend to each learner’s individual needs, freeing them up to focus on the more complex problems. The impact of the symbiosis between real teachers and AI to improve the maths and mathematical literacy levels in South Africa could be colossal, improving an entire generation’s competency in skills such as investigating, generalising and proving could help upskill learners to become digital citizens of the future and embrace the revolution of the 4.0 scenarios. Unfortunately, the current IT infrastructures at the schools that really need it are virtually non-existent and for this, to work we are reliant on connectivity and decent hardware, fortunately, the government departments are in the process of rolling out broadband to the communities. Recently, the Vice Chancellor of the University of Buckingham made a controversial statement claiming that “[t]echnology will replace the best teachers of the future with intelligent machines” – and people took notice. Sir Anthony Seldon predicts that this change will happen within the next 10 years, and the software will become a lifelong personalised teaching and training partner for learners, transforming the educational landscape completely. Meanwhile, teachers will simply become the “assistants” and will maintain discipline in the classroom. Vice Chancellor of the University of Buckingham made a controversial statement claiming that Technology will replace the best teachers of the future with intelligent machines. The concept of “lifelong learning” will drastically change the traditional classroom, providing quality education to those previously disadvantaged. Learners will be able to curate their own learner paths, through online platforms, based on aptitudes and competencies needed for a specific career or from ML-based skills gap analyses. The “brick and mortar” parameters will be no longer be a barrier to quality content and facilitators. With the development IBM’s Watson and IP Soft’s Amelia this technology is on the horizon for integration into the educational sector. With the combination of big data (predictive learning, talent analytics etc.) and digital learning across the segments, comes the opportunity to mitigate the “drop-off” points in a learner’s journey helping them succeed in the education-to-employment pathway. There are human elements that I expect will never be able to be taught by machines and that will always require teachers, such as the abstractions of irony, humour, compassion, curiosity and imagination. Without these critical elements, learners will never have an enriched holistic education. Teachers play a pivotal role stimulating learner’s thinking, providing context and stimulating interest, yielding in academically relevant thinking and creativity. The evolution will result in the elevation of teachers from pre-scribed content delivery mechanisms to higher-level cognitive competency developers providing wisdom instead of times tables. In conclusion, the future of education looks atomically bright and if this symbiosis between man and machine comes naturally, we can start changing the unemployment climate through preventative educational measures resulting in future generations of competent skilled individuals.